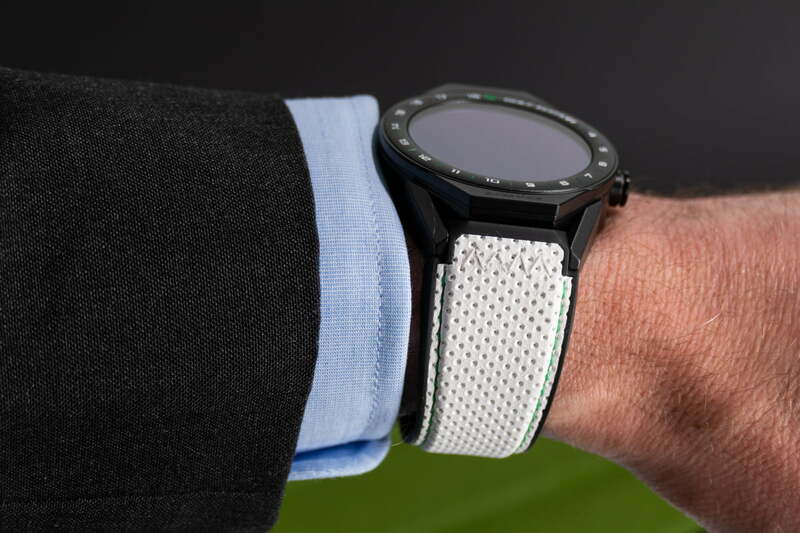 Tag Heuer has announced a special-edition Connected Modular 45 smartwatch that’s aimed squarely at those who spend many hours on the golf course, and want to stay ahead not only in the game but also in technology. Called the Golf Edition, it should not be dismissed simply as a new color scheme, because it’s a lot more than that. When we first heard it was based on the Connected Modular 45 smartwatch, rather than the Connected Modular 41, we were a little disappointed. The Modular 45 — so-called because it has a 45mm body — was always too heavy, and a little ungainly. The smaller 41mm Modular 41 has almost perfect proportions. However, the Golf Edition is different from other Modular 45s, as it’s made from titanium and covered in a black PVD finish. Titanium is strong but light, and it makes a big difference in the way the Golf Edition feels on your wrist. It’s still quite large, but the improved aesthetics around the bezel makes it appear less bulky. Combine this with the lower 64-gram weight, and it’s definitely suitable for wearing everyday, or for hours on the golf course. Take note of the bezel’s design too, with 18 numbers referring to the amount of holes on a course. It’s made from ceramic, so those white lacquered numbers won’t fade, and a sheet of sapphire crystal covers the 400 x 400 pixel screen. A white synthetic leather strap with green stitching is standard and looks superb, just right for a sunny day. 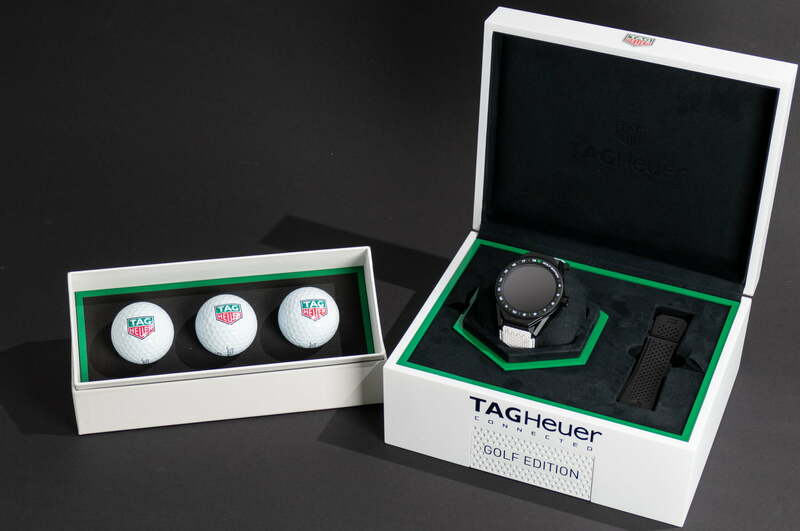 Also in the attractive collector’s box is a black rubber strap, and three Tag Heuer-branded Titleist golf balls. 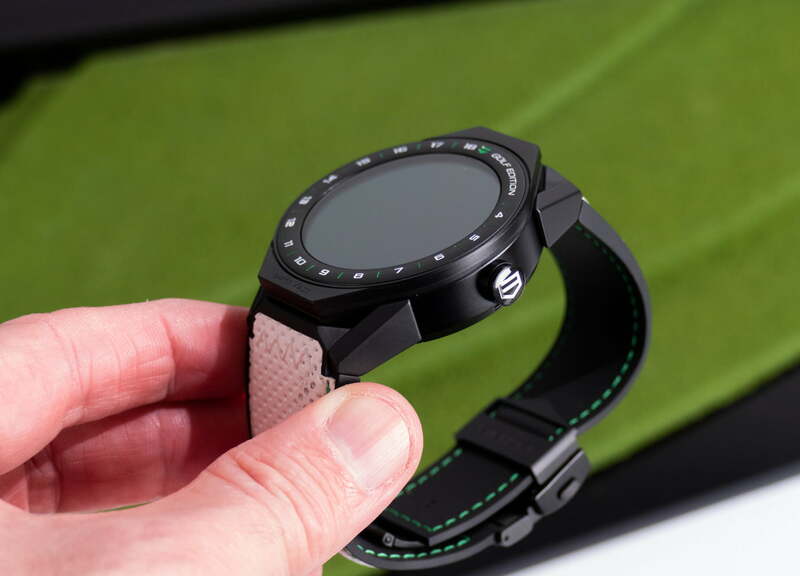 Internally, the Golf Edition watch is identical to other Connected Modular 45 watches, with an Intel Atom processor, 512MB of RAM, 4GB of storage space, GPS, NFC, a 410-mAh battery, and Google’s Wear OS software. 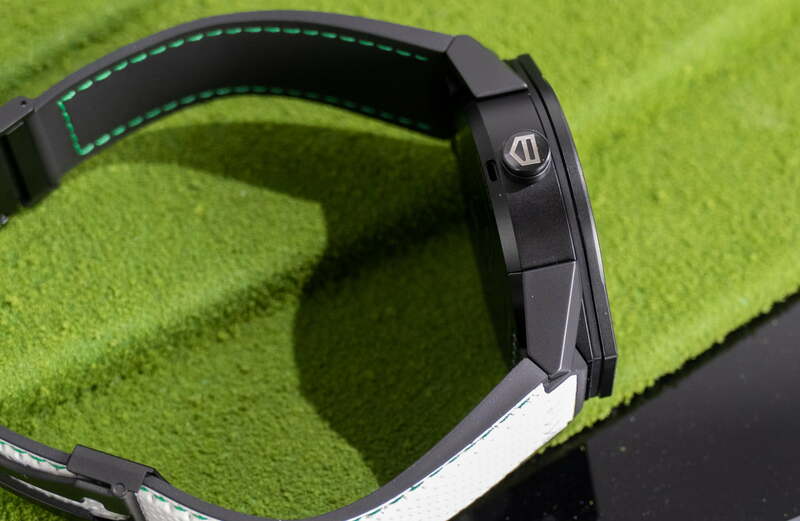 Eighteen months ago, Tag Heuer acquired a French startup golfing app. 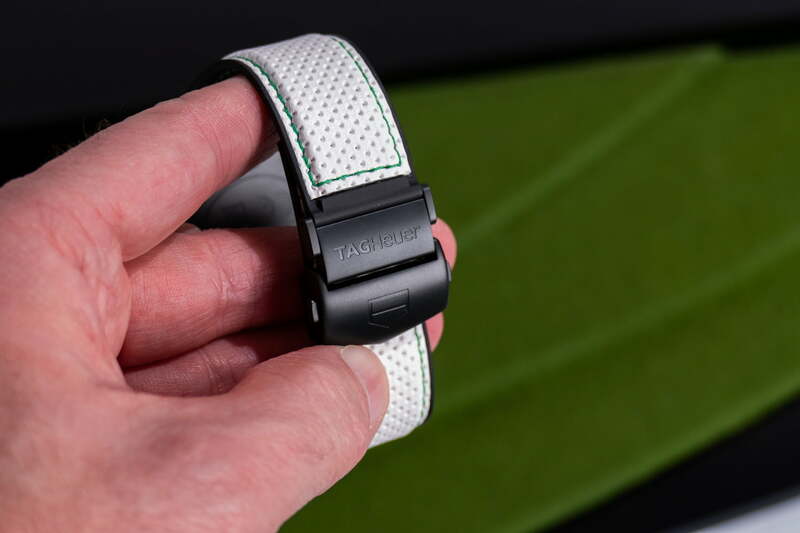 It has been under development ever since and become Tag Heuer’s Golf app — and it’s the perfect match for the Golf Edition watch. Use it on the special edition, and through GPS and vector technology, it can pinpoint where you are on one of the 39,000 courses in its database, show you on a scrolling 3D map, and provide tons of detail on the landscape, hazards, shot distance — all down to just one meter. Tag Heuer says it’s vastly more accurate and detailed than any other golf mapping apps available. It can also keep score for up to four players, and provide shot distance data, statistics on your game, club advice, and plenty more. The Android app is at its best in terms of mapping when used on the Golf Edition watch, but is still compatible with other non-Tag Heuer smartwatches. There’s even a version for the iPhone and Apple Watch too. It requires an annual subscription to get the most from it on an Apple device, but is free to download and use on a Tag Heuer smartwatch. We didn’t get a chance to try the app when we saw the watch, which was not operational at the time, but we did get to try it on and see how it feels. The reduction in weight is instantly noticeable, and the black PVD has a unique warm feel against the skin, completely different from a stainless steel case. 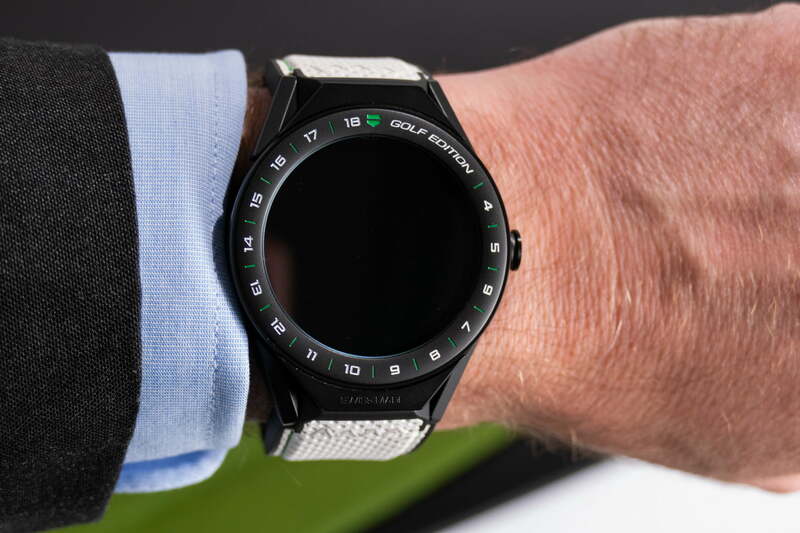 While we were initially put off by this being a 45mm watch, our concerns over the weight were unfounded, and the titanium case has turned it into a viable sports smartwatch. The black rubber strap gives the watch a sleek look, pairing nicely with the black PVD case. However, the white, green, and black combination just works so well, and as the color scheme is as “golf” as it gets, we couldn’t resist it. Swapping the straps is easy, as the Modular range is designed to be quickly taken apart and customized. The whole Golf Edition set, with the slick box and golf balls, make this a very appealing luxury purchase. If you’re tempted to add this to your summer 2019 golfing outfit, the Tag Heuer Connected Modular 45 Golf Edition is available now for $1,850, or 1,600 British pounds.